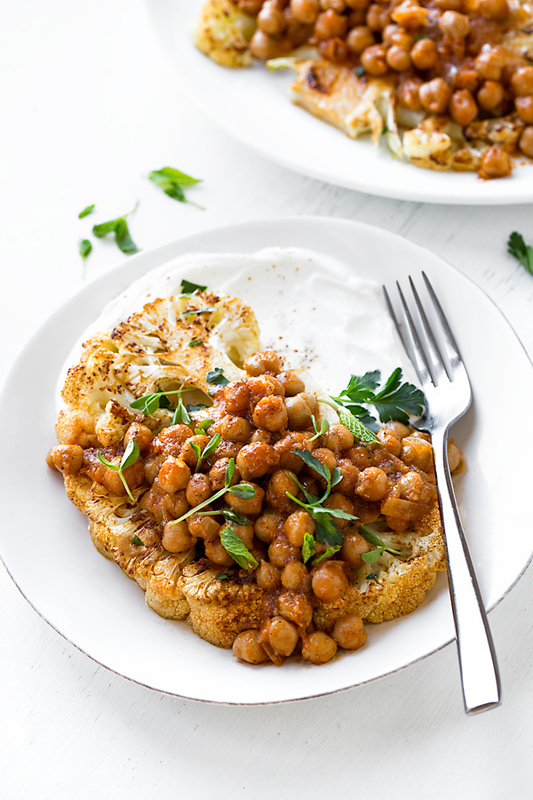 This lightly spicy cauliflower steak with harissa chickpeas spooned over top is a comforting and warming vegetarian meal, one filled with so many flavors and textures that you’ll never miss the meat! While I would certainly consider myself a card-carrying member of the meat eaters club (please don’t ask me to give up that occasional burger or steak! ), I actually don’t eat all that much meat, rather focusing more on quality over quantity. Very often I find myself craving big salads, or simple toasts with a tasty spread and some sliced tomatoes, or a hearty vegetable-filled soup or stew over heavy-on-the-meat dishes. I find a lot of pleasure in eating plant-based recipes as long as they’re full of delicious textures and lots of interesting flavors. When that’s the case, I don’t find myself even missing the meat, because my palate is so wonderfully challenged by so many deliciously complex things going on that it becomes an adventure in simply eating good food. And this beautiful, spicy, and flavorful cauliflower steak with harissa chickpeas is just such a recipe—one that is, in my opinion, the ideal vegetarian meal. If I’m going to plan ahead to prepare and enjoy a specifically meat-free meal, I like to make it one that is going to be satisfying, vibrant, and filled with comforting and cozy morsels. And rather than focusing on the fact that I’m enjoying a vegetarian meal, I’d prefer to simply enjoy an excellent meal. 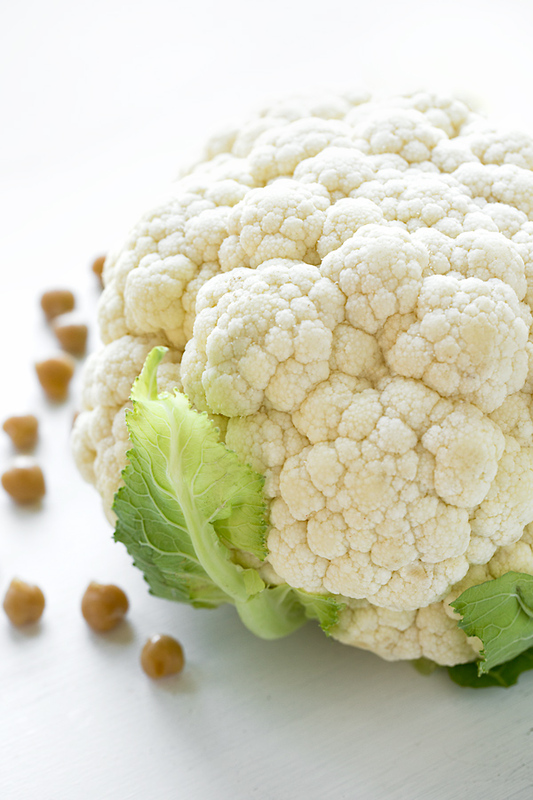 Cauliflower is a hearty and healthy vegetable, and perfect for use in vegetarian recipes. It can take liberal amounts of spices and seasonings, and nicely hold its shape and texture in various types of preparations, such as grilling or roasting. And this, of course, makes it the perfect candidate for a veggie “steak”. I really enjoy spices with some kick to them, and harissa—a mildly spicy seasoning that you can find in either powder or paste form—is one that I like to use when preparing this cauliflower steak recipe and its accompanying saucy chickpeas. I simply cut thick slices (about an inch) from a large head of cauliflower to create “steaks”. Then, I brush both sides lightly with a paste I make from olive oil and the harissa seasoning, and roast the steaks in the oven until tender for about 24 minutes. And to go with these cauliflower steaks, I like to prepare a warm, saucy topping of harissa chickpeas, cooked with a touch of olive oil, tomato paste, onion, garlic, harissa, and a little squeeze of lemon. 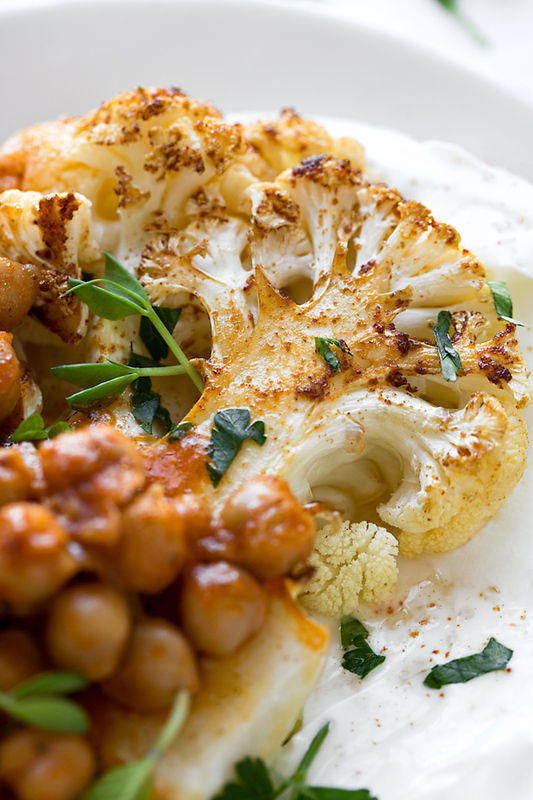 The chickpeas then get spooned atop of those roasted cauliflower steaks, making for a hot, comforting and filling complete meal—a great source of protein and fiber, as well as vitamins and minerals. This delicious vegetarian recipe is both cozy and nutritious, and everything you’d long for in a great meal, vegetarian or not! Choose a larger, firmer head of cauliflower: If you can find a larger head of cauliflower that is fresh and firm, opt for that; it’s easier to cut into steaks, ones that can be a little thicker. 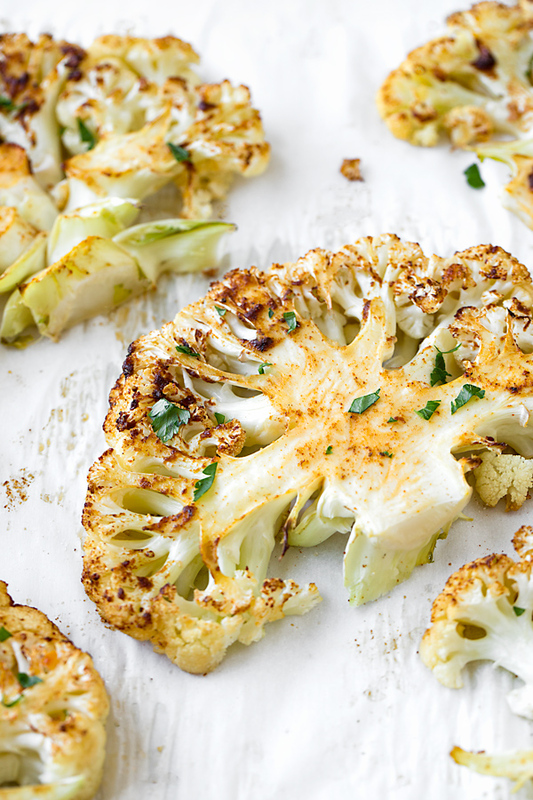 Season both sides of the cauliflower steak: Make sure to brush both sides of the cauliflower steak with the harissa and olive oil mixture to ensure the maximum amount of flavor. Sprinkle with a fairly liberal amount of salt as well. 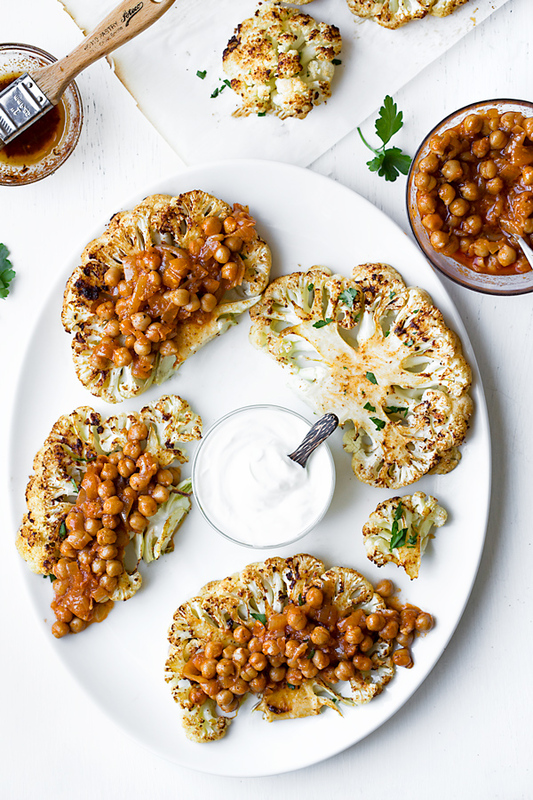 Prepping ahead: While it is best to roast the cauliflower steaks just before you’d like to serve them, you can easily prepare the harissa chickpeas the day before and reheat them in a pan before spooning over the steaks. Where to find harissa (and what to sub if you can’t find it): I purchase my harissa seasoning in the spice section of Whole Foods Market, and you can also order it online. But if you can’t find it, simply make your own “quick” version by combining ½ teaspoon cumin, ½ teaspoon coriander, ½ teaspoon paprika, ½ teaspoon chili powder, ½ teaspoon granulated garlic, and a pinch of cayenne. 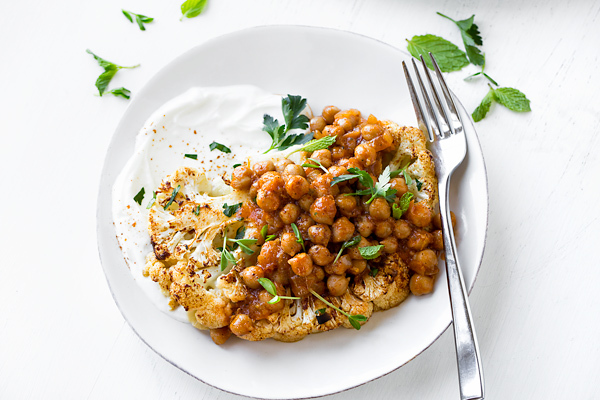 This recipe for cauliflower steak with harissa chickpeas spooned over top is mildly spicy and warming, and makes for a delicious, healthy and comforting vegetarian meal! –Preheat the oven to 400°, and line a large baking sheet with parchment paper. –In a small ramekin, combine the harissa seasoning with the water to make a paste, and then add in the olive oil and mix; set aside for a moment. 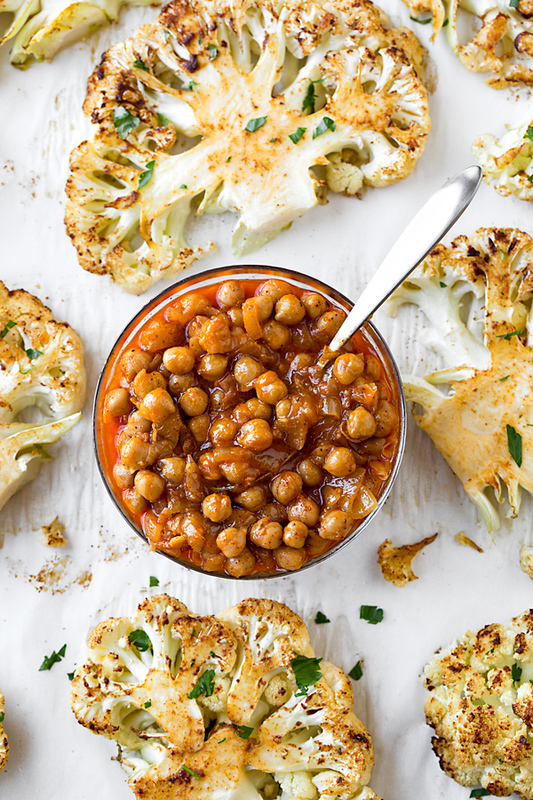 –Place the cauliflower steaks onto the baking sheet, and brush both sides with the harissa/oil mixture, and sprinkle with salt and tiny hint of pepper; place into the oven to roast for about 24 minutes, or until tender with a little bit of a bite; in the meantime, prepare your chickpeas. –To prepare your harissa chickpeas, place a medium-large skillet over medium-high heat, and drizzle in about 3 tablespoons of the oil; once hot, add in the sliced onion and saute until tender and golden-brown, about 5 minutes. –Add in the garlic and the harissa seasoning, and stir to combine; once aromatic, stir in the tomato paste until incorporated, then add in the chickpeas; add the stock, a pinch of salt and pepper, and stir to combine; cover with a lid and gently simmer for 10 minutes. –Stir in the zest and the squeeze of lemon juice and keep warm. –To assemble, spoon over top of each roasted steak equal portions of the harissa chickpeas, and sprinkle over some mint, cilantro, parsley, and/or micro greens; serve with a dollop of the yogurt on the side of the cauliflower steak. Enjoy! 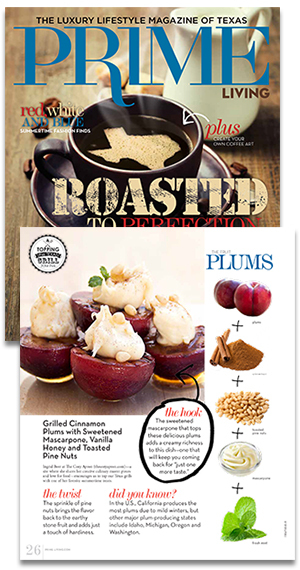 Printing the recipe now… this looks amazing! 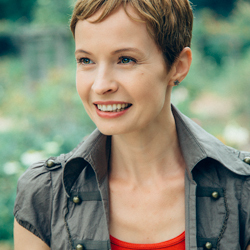 Hi Amy, thank so much! Hope you enjoy it! This recipe is so perfect for me. I LOVE cauliflower and I love spicy so the two are a marriage made in heaven. The protein in the chickpeas is an added plus. Thanks for the tip on the homemade Harissa as my market does not carry it. This will be my next meal. Also love the meatless recipes. Hey Rebecca, I’m thrilled you’re planning on making these tasty vegetarian steaks! I hope you enjoy the recipe, and I appreciate your feedback on the meatless recipes. Happy cooking!